The Urban Lumber Company is excited to have an exclusive partnership with Kansas City artist and designer Amie J. Jacobsen to offer a full line of standard and custom metal table bases. Amie J. Jacobsen is a multi-facetted artist and designer currently producing work in sculptures, artisan furniture, and painting. She holds a BA in Studio Art, as well as an MFA in Illustration from the Savannah College of Art and Design (SCAD) where she also taught in the Foundations, Illustration, and e-Learning department from 2006-2015. In 2015, Amie took the opportunity to learn metalworking as the in-house designer and resident artist at Machine Head, a metal fabrication shop in Kansas City's Crossroads Art District. Amie moved into her own studio space in 2017, and now splits her time between Colorado Springs, CO and the Kansas City area where she maintains a studio and workshop. 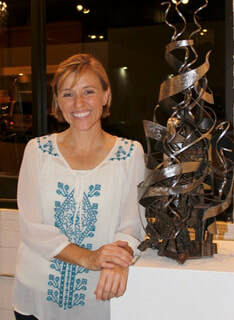 Amie's work includes steel sculptures, artisan furniture and décor, and she still loves to paint. Each of Jacobsen's custom table base designs are made to order to fit the specific size and shape of your table, desk, or bench. Once you choose a design, email us about finishing options and the dimensions of your top. If you do not see a base design that you are excited about, contact us and Amie will be happy to design a piece uniquely for you! Browse our custom table bases here. Browse our standard table base sets here.